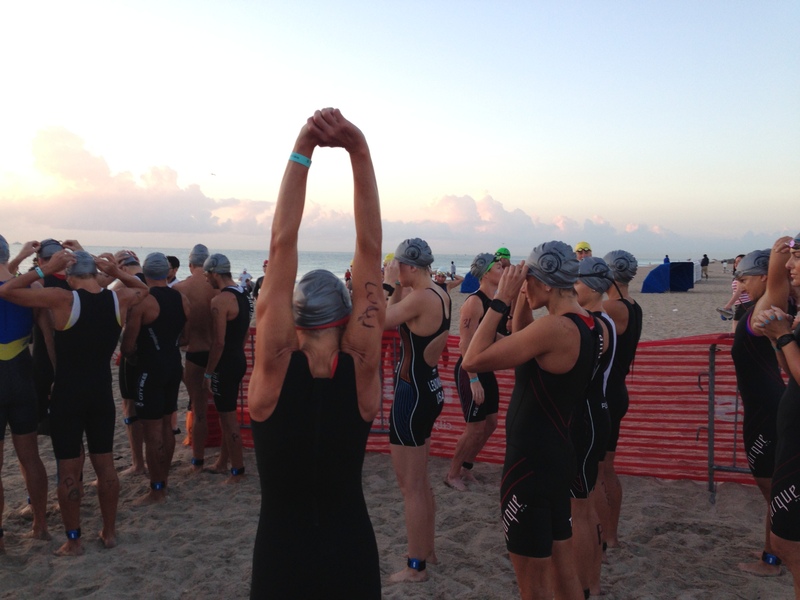 When I left for Florida on March 4th I was planning to race twice but I ended up racing three times with a last minute decision to race at Las Olas international distance tri in Ft. Lauderdale. If I quick flash back to that week, Lifetime had just announced that they would not be holding a professional tri series anymore and in that instant, the majority of my season’s racing plan was erased. That left me with a couple options: get more serious about draft legal racing or go long-distance. Neither option had me jumping for joy. After racing at Clermont on Saturday and being very disappointed in my performance, I began to question my choice for even taking my pro card. I wanted to go pro to have the opportunity to race the best athletes out there, now the majority of those opportunities disappeared (Olympic distance non-drafting). Sunday I started to scour the internet for races and came across the Las Olas race and immediately saw they would be having a pro field. I checked the date for the race, Sunday March 15th, which was the day after Sarasota. I quickly mapped it out and Sarasota to Ft. Lauderdale was about 3.5 hours with no stops. I’d be done racing by about 1pm Saturday and with a stop for food I could be there by 7. I had to be crazy. I looked at the race website and there was a pro meeting on Saturday at 3pm, which I couldn’t attend and entries were full so I wasn’t sure if there would even be a spot for me. I emailed the race director to find out. Monday I heard back from the race director and she said she’d have no problem getting me into the race but wasn’t sure about missing the meeting. I connected with the head official; he sent me the rules information and I was OK to miss the meeting but still race. I wasn’t 100% sold yet, I didn’t want to drive the 4 hours by myself to Ft. Lauderdale after racing and while I had my TT bike, I didn’t have my TT race wheels (although the Zipp 303’s would have been pretty good) or aero helmet. I slept on it. I couldn’t stop thinking about the race so Tuesday I emailed Coach Phil to see what he thought. I also phoned home to have Lisa bring my aero helmet to Florida when she came later that week, just in case. As I suspected, Phil wasn’t sure it was worth the risk of injury this early on in the season and I agreed, especially with the knee issues I’ve been dealing with. Also not being fully prepared… if it didn’t go well, how would that affect my race mentality for my first big race in April? I put the race out of my mind a bit but I still couldn’t get over how I’d feel looking at the race results after wondering what if. Thursday night at 10:30pm I got a call from Phil. It was brief, something like: looks like you’re recovering just fine and looking strong, I think Saturday will be great, if you think you want to race Sunday what the heck lets go for it. I hung up the phone and called Patrick immediately to see what he thought. I researched hotels, flights, and cars, the race registration wasn’t available so I researched as much as I could and waited till the morning to call the race director. First thing Friday I got a hold of the race director and confirmed my entry into the race. We found Patrick a flight to Orlando for that same night and we booked that along with a hotel and car. That night I got all my gear ready for Saturday’s race and made lists of all the things to be done after the race. 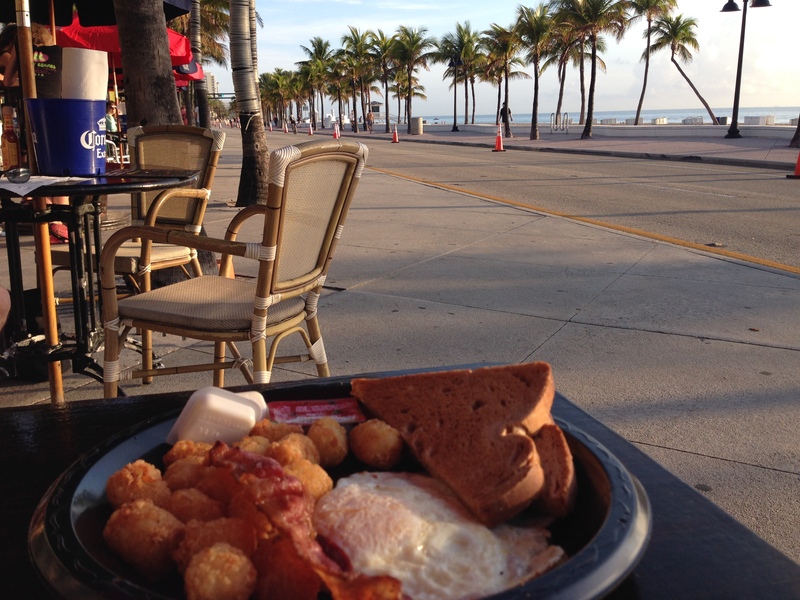 Patrick landed in Orlando after midnight, picked up the car and drove to Sarasota by 3am. I’m lucky this worked out because he was able to bring my new Zipp 808 and Super-9 race wheels for me to ride on Sunday. After the race Saturday we gathered in the parking area and went over my list of things to do: move my water bottle holder, adjust my seat height, fill my race wheels, move my pedals etc. I gave my sister a good luck hug as she was racing Sunday as well. I hugged my Dad goodbye and he almost broke into tears, this would be the first triathlon of mine that he wouldn’t see. He hasn’t missed one (parents I’m sure you know how this feels right?). Patrick drove us to Ft. Lauderdale so I was lucky to be able to relax a bit in the car, review the rules for the race and check out the race maps. When we arrived around seven we changed out my wheels and I realized I didn’t have the right magnet for my speedometer but we were able to awkwardly tape one (with the little spoke pointing outward) onto the Zipp Super-9 disc that worked. Since I wasn’t planning on racing until April I hadn’t figured out what I was going to use as a bike computer. I’d been using my old iPhone, which is heavy and huge but I didn’t have an option at this point so I strapped that on to my aerobars with some zip ties. I think I finally laid my head down around 10 after some final preparations were complete. My alarm woke us at 4:45 am, I needed to be to the race site early to get checked in. We packed up all our gear and headed to the beach. It was still pitch black out when we arrived. We unloaded my gear, found transition and got checked in. 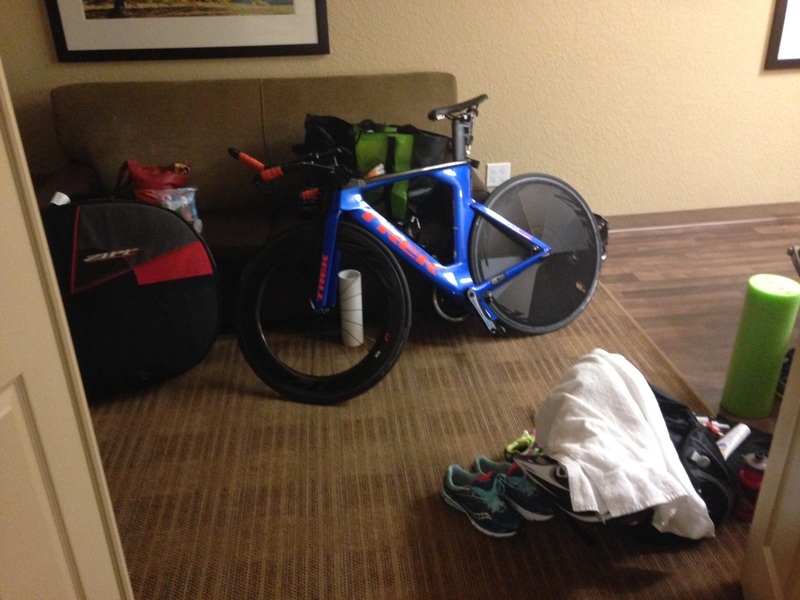 In transition I was racked next to 2012 70.3 and Ironman World Champion Leanda Cave. I went about my transition preps per usual but when I went to put the final touch on my shoes I realized I had nowhere to attach the binders for my shoes. There were no screws in the seat tube and my water bottle cage was on the down tube. Having just learned a flying mount I didn’t want to switch to have my right shoe forward and left shoe back just in case I needed to default to my old mount. I decided I would move the bottom water bottle cage screw and the top screw would hold it OK. I went to check the top screw and it was super loose so I gave it a spin and suddenly the screw head was on the end of my allen wrench. I went into a bit of a panic; I now only had one screw available to hold my water bottle cage. Not wanting to break anything else, I taped my cage onto my bike and left it. With no other options at this point I made a really long binder back to my skewer on the left and just went with it. By this time they were clearing transition; I did a quick jaunt on the road by the beach and walked the 1 kilometer down the beach to the race start. 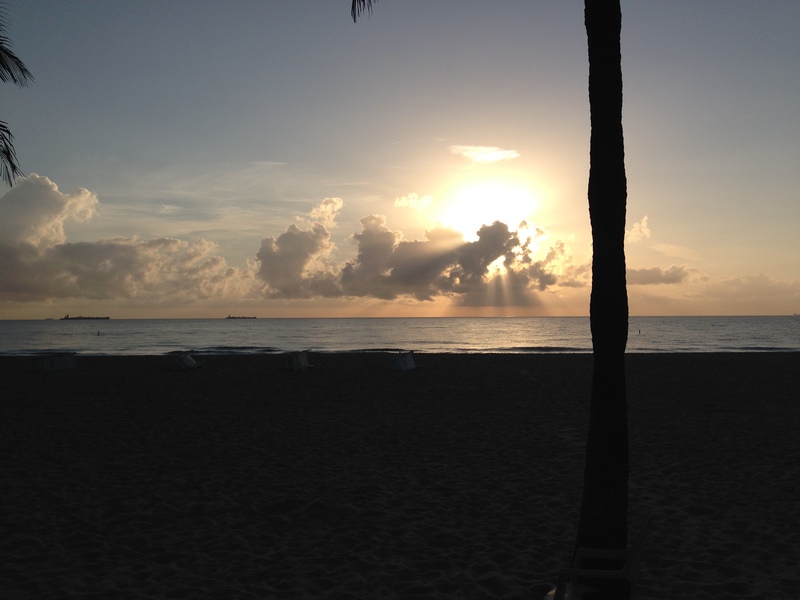 The sun was just rising over the ocean as I went for my warm-up swim. The water was 75 degrees so I was happy it would be a non-wetsuit swim (I just wish it was a 1.5K instead of the 1K). Just a little late, they finally were lining up the men. After the men took off the women were lining up. I kept my eye on Sara McLarty and Leanda, since Sara is known as one of the best swimmers in triathlon I was excited to see how we’d match up. The gun went off and we sprinted down the beach to the waves rolling in. After the last two races I knew this first little sprint was important so I booked it more than usual and was in the front to dive into the ocean. One dolphin dive and we were swimming. I swam arm and arm with Leanda to the first buoy but could see Sara just ahead so I pulled away quickly and tried not to let Sara get away. I kept Sara within a few body lengths as we swam parallel to the shore. After six buoys we cut directly back into the beach letting the tide help carry me in. It was a little difficult to tell where to get out of the water as there was nothing marking the exit at the beach. I used a few men exiting the water and the crowd as a guide. I chased Sara into T1 and I was very happy with my position at this point. I got to my bike, threw down my gear and snapped my helmet on for a speedy transition. I grabbed my bike and went chasing after Sara. This part of transition was fairly long and through a grass corridor, all the bumps set my binders free and both shoes were spinning. Ahead, I saw Sara ran with her bike right off the edge of the curb for an extra big bump, I gently lifted my bike to avoid knocking my bike out of control, although it was too late for my shoes. I got to the mount line and was too nervous to do a flying mount with unstable shoes. My left shoe was too low to the ground to get momentum to mount so I bent down to adjust my shoe so I could step on it for my usual slow, now extra slow, mount. I lost some precious time here dealing with my shoes but I made the decision to go with the safest approach, no need to fall off my bike at this point in the season and I didn’t have a pack of bikers to catch. After finally mounting my bike I got up to speed and slid into my shoes. It felt great to be back on my TT bike, this was the maiden outdoor ride for me and the new Trek. Once I was locked in I set my sights on Sara off in the distance. I wanted to catch and pass her. I made good ground on the straightaways but I lost some time on the turns. After about an 8 mile loop we turned into a park where we rode a trail through a wooded area. I was able to maintain my distance but the snake-like trail through the woods didn’t allow for a good opportunity to catch and pass. After the “forest” we looped back to transition for a second loop. 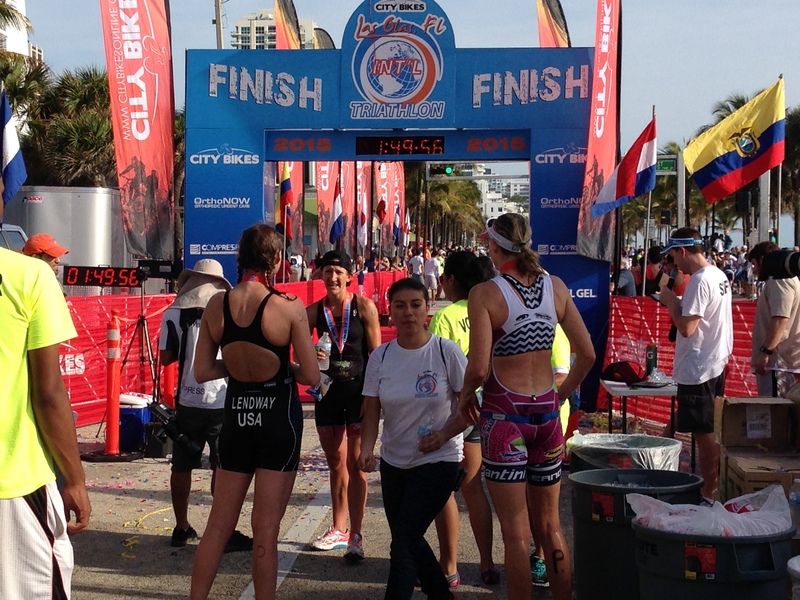 By this time many of the age groupers were out on the course so it was very crowded. There were oftentimes two or three bikes riding side by side on one side of the road with a few more staggered behind. People were fairly responsive when I yelled out “on your left,” but of course there were the occasional people that didn’t move and you’d have to wait for a clearing. I was able to pass Sara at some point when she was caught in the crowd but she passed me back on a turn just a few miles later. With so many people on the road I just wanted to maintain my distance to Sara and be safe. Sara and I each had a motorcycle following us the second round so I was overly cautious about being out of the draft zone. The second round of riding through the forest was difficult with so many bikes on a small trail but I maintained my distance and kept at it. I finished my bike feeling good about my ride. I caught up to Sara running into T2 so we racked our bikes at about the same time. I slid my shoes on, grabbed my bib and ran out as Sara was still getting into her socks. Running out of T2 someone yelled, “first woman.” I was slightly surprised, I thought a woman had blazed by us on the bike but I was mistaken! It felt pretty awesome to be leading out of T2 in my first non-draft professional race, I enjoyed that moment briefly as I knew the hardest part for me was ahead and I was positive I would hear the pitter patter of Sara’s feet at any moment. My run was feeling good, I was nervous that my legs might start to feel heavy and fatigued after all the work I did on the bike the day before (and I suppose running) but I settled into what felt like a manageable pace. As I ran by Patrick cheering I gave him a high five, which just shows I was feeling pretty good. I hit the first water stop at the mile marker and felt like very little time had elapsed. Another half mile to the turn-around and I was still feeling pretty good. I didn’t even bother to glance at my watch because I didn’t want to know what speed I was running or how far back my competition was. Maybe 30 seconds after the turn around I was surprised to see Leanda had already overtaken Sara and had made decent ground on her. I figured Leanda would come smoking by me so I just kept with my pace. After the mile 2 water stop I suspected Leanda was closing in but it took her longer than expected and she didn’t pass me until just before the 5K turn around. At this point my mouth was a bit dry and the sun was in full effect, so I worked on getting to the 4 mile water stop. When I reached mile four I drank a cup of water, poured one cup down my tri suit and two cups on my head. I hadn’t gotten water at mile two so this was a little overdue. I felt revitalized almost instantly and thought wow only two miles to go not bad (that’s something I’ve never thought before). This time at the last turn around I looked at my watch. I had about three minutes of time over the next girl and about another minute on the next with just over a mile to go. Whenever I figure out my lead time like this my first thought is, “I could walk for….” but I erased that thought immediately, doused myself in water and held strong for the last mile of the race. I crossed the finish line in 2nd and I couldn’t have been happier. I finally looked at my watch to see my run pace and was very pleased to see I held 6:23 pace which is a PR pace for an international distance race. Leanda and I congratulated each other at the finish and waited to cheer on the rest of the podium. It was nice to chat with Leanda after the race and hear a little more about her, she was very sweet and encouraging to me. After the race I anxiously awaited for results to be finalized. There were no penalties that I was aware of so the results stood and I was officially 2nd. I’m so glad that I was able to make this race work out. I’m not usually the type of person to do something unplanned but the last minute decision left no time to be overly nervous leading into the race, I just had to let my body go into autopilot. While some things maybe didn’t go exactly right, like my water bottle cage, my bike shoes and my seat post which I later found out was set almost an inch and a half low (I could feel this riding), I was still able to put together a good race. After racing here I feel I’ll be much more prepared for my next big race in April. It felt amazing to be racing again in my favorite non-drafting distance (on my Trek TT bike that I love so much), it was a good reminder of why I love to train and race. I can’t wait for my next race! After the race Patrick and I packed up and drove to Orlando where Patrick caught a flight home. Stopwatch Greg picked me up to head back to St. Pete’s beach where we were spending the night with Lisa and my nieces. We had a relaxing dinner in the condo, “Bappi” and all his girls, celebrating Lisa finishing her first half iron (and dominating the field) and my first pro podium. The Lendway ladies, 2 big sisters and 2 little sisters snuggled in one king size bed for the night. We spent the next morning on the beach catching some rays and I got in one last leisurely ocean swim (I’ve fallen in love with ocean swimming) before heading back to Orlando for my last night. This was a great end to my back to back racing weekends. Huge thanks to my support team, Dad, Mom, Patrick, Lisa, Stephen, Kiddos, Phil and Gear West, for helping make all of this possible, I’m one lucky gal. Also a heads up, I’ll be hanging out at the Gear West Tri Expo Saturday April 18th and Sunday April 19th, please stop by and introduce yourself! Industry reps from Zipp, Blueseventy, Trek and many more will be there along with many of my Gear West teammates to answer any tri related questions you may have as you’re gearing up for the season. Free group workouts, free food (and Caribou Coffee!) and free tube changing classes (some of which I will be teaching!). You can also catch up with some of your favorite race directors and announcers! 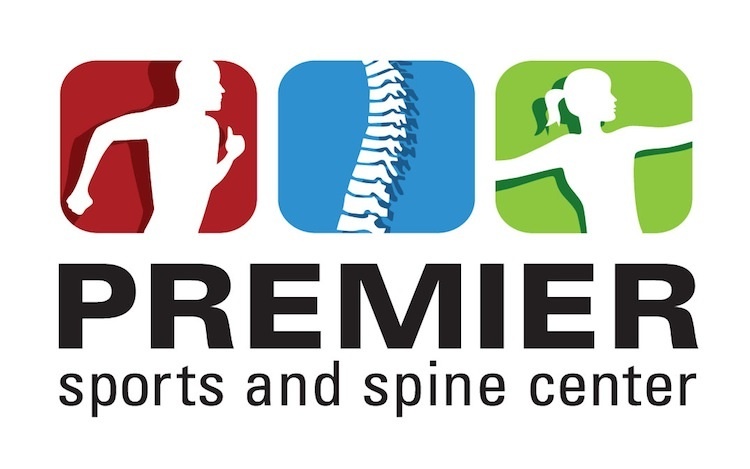 Don’t miss out, stop in, join us for a workout, catch up with friends or make some new ones. See you there! Heather, you are such a brave and strong athlete! 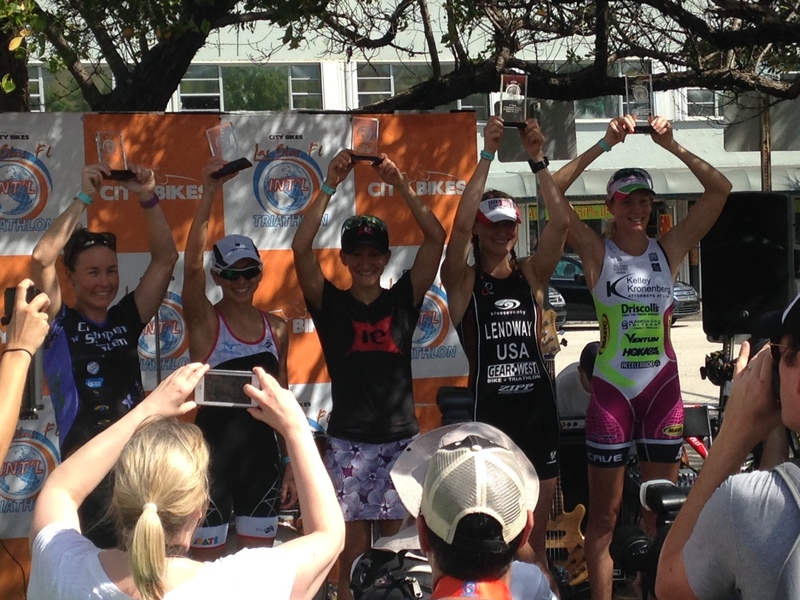 It is SO fun to follow your races and to read your really well-written, honest blog posts. I can’t wait to read more!